The Blue Server™ is a powerful server based transform solution that converts and distributes output from IBM System z®, IBM System i® (IBM Power), Infoprint Manager and other platforms. Blue Server enhances any document workflow without the need to modify the applications generating the data. 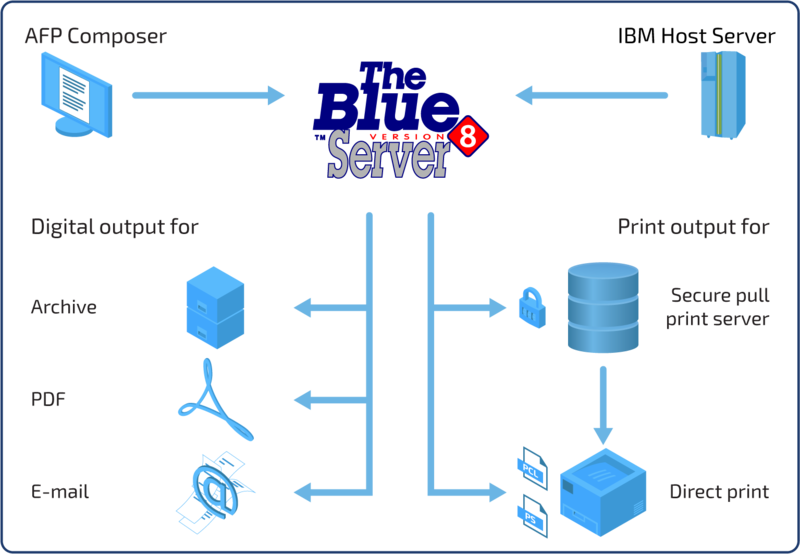 The Blue Server™ automatically translates AFP, IPDS and SCS data to PCL, PostScript, PDF and a variety of other formats for printing, viewing, archiving and distribution of documents from host server applications. The Blue Server™ software has the capability to customize existing PCL and PostScript print jobs to leverage unique printer features including stapling, punching and duplexing. The Blue Server™ allows you to share documents electronically via e-mail and fax, as well as conversion of AFP or IPDS data to PDF and PDF/A to engage with modern workflows for electronic archiving or document distribution. The Blue Server™ supports the majority of PCL and Postscript printers. MPI Tech works extensively with all major printer manufactures testing comprehensively to guarantee there is no compromise in printer performance and all printer options are available to host print traffic. The Blue Server™ now can be incorporated in to print cost accounting and secure print solutions, for example our own Safe2Print™ secure printing or a 3rd party secure print or accounting solution. The Blue Server is able to capture host user/job names then cross reference users adding relevant metadata and PJL commands enabling easy integration into the majority of print tracking/accounting solution available. With over three decades of pedigree The Blue Server solution is used and trusted by a large number of global, multi-national brands to deliver their host based output. Contact your local MPI Tech office to find out how Blue Server can benefit your organisation. Supports large printer install (more than 500 printers per server). Very high speed conversion for production environment up to 10,000 pages per minute (depending on server and application).